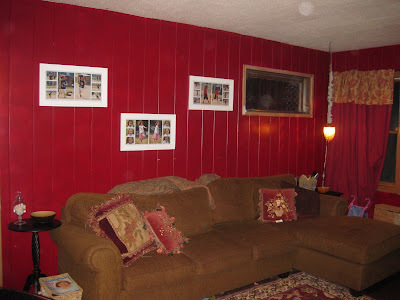 "I think I'm going to repaint my DEEP red den this lovely color(monroe bisque)...the red is feeling soooo heavy-add in some drop cloth curtains and I'm good to go! I also have a red brick fireplace that goes up to the ceiling-should I just paint the brick that color too or go for another color? Contrast? Or just simple? And then I have 3 of the most bizarre windows in the entire world. And my hearth is funky. It's raised about 2 feet off the floor with a big concrete hearth bottom thingy...I have visions of somehow enclosing the entire thing and tiling it (slate? travertine?) but have no clue how to start that! I have a psycho insane life and the red feels so intense. And isn't the fireplace just WACKED out? But the mantle? I work for a custom woodshop (I know, you're jealous) and it was a display that they were about to throw away! And it's...well...velcroed to my firebox, nester style :) But it DID make my amazing photos taken by my amazing photog friend Amy. I'm attaching 2 of the windows-and there is 1 more like that. What the HECK were they thinking???? Like the entertainment center I got on craigslist for $75? It's a little more mod than I like but its fits the space (and our tv) perfectly. I am contemplating painting it black. But I'm afraid! I have a brown chenille couch and a small red oriental rug-but I'm not wedded to the rug at all-it only cost $25. Ideas?? " I think Sara has the right thinking of going lighter. With the small space, I think it will really open it up and it will feel much calmer. I would go with natural creams and beiges with the couch and choose a natural green or blue to use for accents. I think her thoughts of dropcloth drapes on all 4 windows would be a great, low cost choice. I would choose one photo for the mantel and put it in a big, chunky frame with a few other simple accessories like some candlesticks. 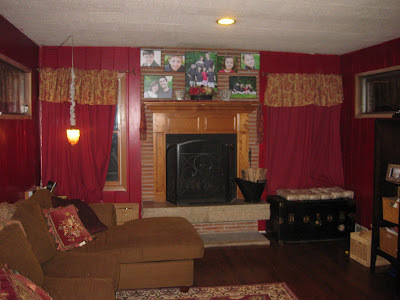 I would paint the mantel and the brick a creamy white and the walls a neutral monroe bisque, plantation beige, or ivoire. If you want more a contrast, you could stain the mantel to match your wood floors, which would also look very rich. I think the pictures of the (adorable!) kids in the white frames are too small scale for the wall~maybe a big grouping of all black or all white frames? That light placement is very interesting...I would get rid of it if I could and bring in a lovely floor lamp with a shade. That trunk is awesome, but I'm wondering if it would be better displayed in another room of your house? I would clear out as many little furniture items as possible to open up the space and keep it simple. Velcro, Sara?? Wow :) I applaud your ingenuity, but you might want to secure it a little more... I would frame out the rest empty spot in the hearth and then tile it. You can google tiling a stone fireplace and lots of different ideas and tutorials will come up. 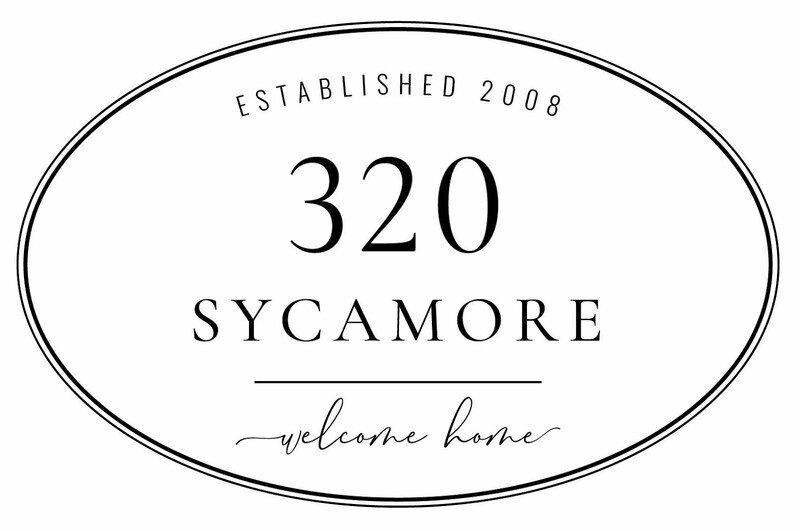 Layla had a great tutorial on her blog for her fireplace as well. Now that window...what is on the other side, Sara? Would it look cool to paint the frame black and make it a little picture window, or maybe just cleverly cover it up? I would definitely paint the room a lighter color- tan, cream or yellowish colors would be great! I also think a large mirror above her couch would help bring in light. I would also change the window treatments for something lighter. Not sure what.... maybe if they were just "fakers" on the sides. :) Love the room size and the fireplace! I would definitely not paint the fireplace until after the finish product of painting the walls. I love the color of the bricks! Such wonderful space to work with! Good Luck Sara! I'm sure it'll look great! I think that is a realitively small room to be such an intense color. I would go for more of a lighter, creamy tan color and paint the brick & woodwork white. Then I would restain the wood work (after attaching it well) a darker, espresso color to make it pop. Then I'd do some of those drop cloth mistreatments that I see laying around in blogland these days (I have my own version, too), and the sofa you have should match in there pretty well. Oh, and I'd paint that fire screen a creamy tan (try Krylon's Pebble spray paint). Then it would all be serene and relaxing. Can't wait to see what you do, Sara. My suggestions for the corner window is to use matching treatments on both corner windows. Even though the other window is small and awkward, I would treat it the same as the large window and give the effect that the windows are the same. 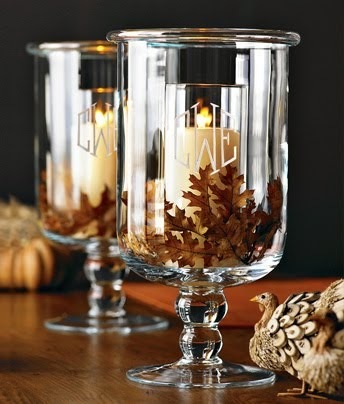 Here is a picture of what I'm talking about, it's not necessarily the style or color, but just the general idea. I like the suggestions so far! I can't wait to see what she ends up doing! Great ideas, everyone! Keep them coming. Linds and Melanie~those links are perfect~thank you!! I agree with Lu... don't paint the bricks. I also wouldn't touch the mantle; the stain is very elegant. Once you paint the room a lighter color, I think the fireplace area will look great just as it is! Good luck. Once you paint your room the lighter color with whtie trim you will have a better foundation to work off of with your accessories. I definately think you should paint your brick maybe not a stark white, but perhaps a color that is a few shades lighter than what you paint the wall. Just take a look at the paint card and pick the one that is the lightest. I think John and Sherrys room from young house love will be a perfect inspiration for you. My living room was about the same color as this and I painted it tan. What a difference! I love it and its so much more calming and bright. I felt trapped with the other color. I would go with a tan which is hard. I don't care for the yellowy tans. Chekc it out! You'll be amazed at what they did with their own paneling and brick. AWE. SOME. HA! Linds and I must both subscribe to the Young House Love blog!! On my post today I showed my fireplace brick that has just been painted. I painted the brick a creamy beige that is also the color of my walls (half panel up to chairrail). The panel is painted the creamy beige too. I am having a 4" deep cushion made for my hearth to bring in some color. She should do that too. Maybe a rug would work on the bottom of the hearth?? Take a look at my painted brick. I LOVE it! OK so everyone agrees: tan it is. It just feels SO intense in there. And my kids are a tad intense to go with the intensity, so I'm taking the plunge. I like the idea of waiting on painting the brick until after the room is done. Can you all take another peek at my "hearth of death" as we call it? Notice how there is a large open space underneath the hearth itself? What on earth to do with that? Upon reading your opinions of my photos, what about this-move the large montage from over my fireplace to over my couch, and reframe the collages (maybe just spray the frames cream?) and move them to a cozier montage somewhere else. And what do y'all think about using the trunk as a coffee table instead? And about the drapes/bizarre windows-I'm a bit nervous to hang 5 sets of panels in the the room-and I have a closet that somehow the pic didn't get in that has curtains as well-so I'd have 6 sets of panels hanging in the room. Too much? Or can it ever be too much fabric??? I love the window idea shown above and think that you should defintely use that near the fireplace, very skinny rodes hung high. That would leave that end of the room symmetrical which to me is very important on the large scale of things. I would leave the wood work, love that! Leave the brick even it adds a lot of character. I love the adorable pictures and love that they are color! I am a color girl. Now for that place in front of the mantle. I would add some sort of indoor firewood box. Give it a purpose. Is that concrete or tile around the mantle? If it is concrete I would stain it almost a oil rubbed bronze finish to give it more of a substantial feel to the concrete. Jersey Cream from Sherwin Williams is a nice warm color with an undertone of beige and yellow which will brighten the area.You will be able to use marronish red decor as accent. It will not conflict with the color of the couch but will blend well with the red tones of the brick. I would move the couch and everything down past the windows. Where the extra window is with the couch moved down ( not conflicting with the window treatments hanging over ) I would feel that you needed something tall to balance the fireplace while making the are feel larger. Either a large bookcase a tall (target runs great deals on the 5 shelf ones) entertainment center to the ceiling. Place in front of that extra window. How high is the ceiling? If you use none of these ideas, I will still love to see what you do! Red Brick Fireplace: Let's be honest. Red Brick is for garden walks, outdoor barbecues, and covering with needlepoint for a doorstop. But if you are stuck with a red brick fireplace, do not despair. With careful planning you might grow to love it. The worst thing you can do is make believe it isn't there. A red brick fireplace can be a difficult design element in a room but if that is what you are saddled with, there are ways to live with it other than painting it white or black which is problem in itself. The painted white fireplace soon looks dirty and is impossible to clean, and either color will have difficulty adhering. So, let's leave it unpainted and see how we can live with it. Let's consider leaving the floors a natural color and buying a patterned rug, with brick reds. 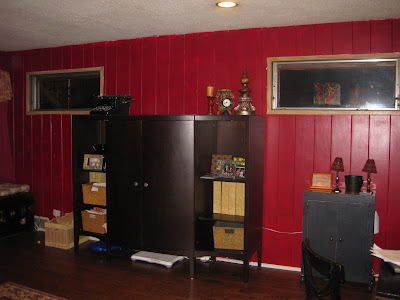 The Oriental patterns are easy to integrate, mostly the red that blends with the brick shade of your fireplace. Native Indian designs should also be considered and contemporary designs, the bolder swirly ones are a good choice. Whichever you choose, make sure you check the shade of red. It should be in the same family as your fireplace. Find a paint chip that is the same and take this chip to the carpet store to help with your rug or carpet selection. You can find specific info on colors for the rest of the room including the upholstery and artwork in an Ezine article entitled Design challenge-Red Brick Fireplace or on American Made Yes, Furniture American-Design Challenge. Considering bamboo shades for underneath curtains. WIll roll up rug-maybe look for new one or just leave it bare. I would paint the walls a taupey color and all of the woodwork- including the mantel, white. I wouldn't paint the brick, especially without seeing how it looks with the walls and woodwork painted. I think the contrast of the tans and reds in the bricks would be nice. I would do the dropcloth drapes, and use the same couch, just change out the pillows. I'd probably move the things on either side of the fireplace and frame the one big family picture and hang it in the middle of the mantel, and put the others on tables or other walls, and put some other accessories on either side of the framed pic to balance it out. The main thing I would do that I think would make the biggest difference is to get rid of the red! I would think abut adding crown molding. It would frame the wall paneling out nicely. If you hang curtains- hang them as high as possible to create a taller room effect. Paint the wood but leave the fireplace - you might like having some color among the sea of white and beige! 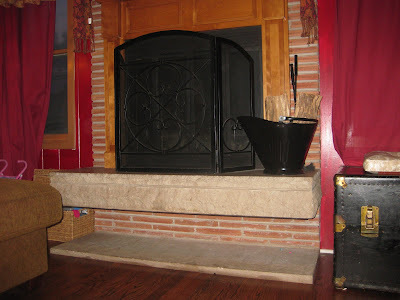 As for the funky box below have someone come in and frame out the empty space and apply a stone veneer or tile over the entire hearth to make it look like one piece. I had a similar problem with my windows in my bedroom. I hung panel at the big windows and then cut one panel in half horizontally and hung the each half panels at 2 seperate windows with ribbon tied at thirds to create a similar look but not long like the panels. I would definitely use the trunk as a coffee table. 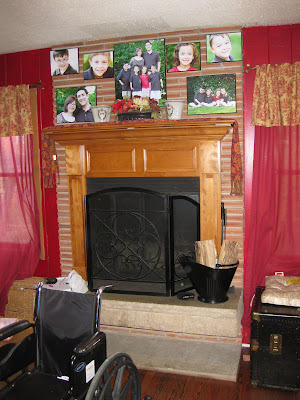 I also say paint the brick and stain the mantle to match the floor. I am wondering if I can send you a design challenge for my kitchen. We have been in our house for 3 years and I still haven't figured out what to do with it. The cabinets already have the wainscotting look in the center panel. I want to get it done so I can move to a neighborhood that has kids. There are none in our neighborhood.